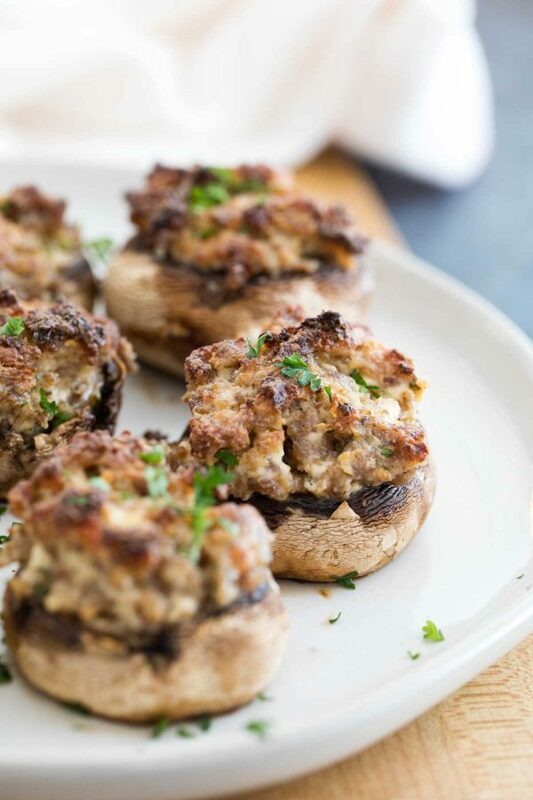 An easy and crowd pleasing appetizer – these Sausage Stuffed Mushrooms have fresh mushrooms that are stuffed with sausage and cream cheese. I am all about the appetizer recipes, especially at the end of the year. 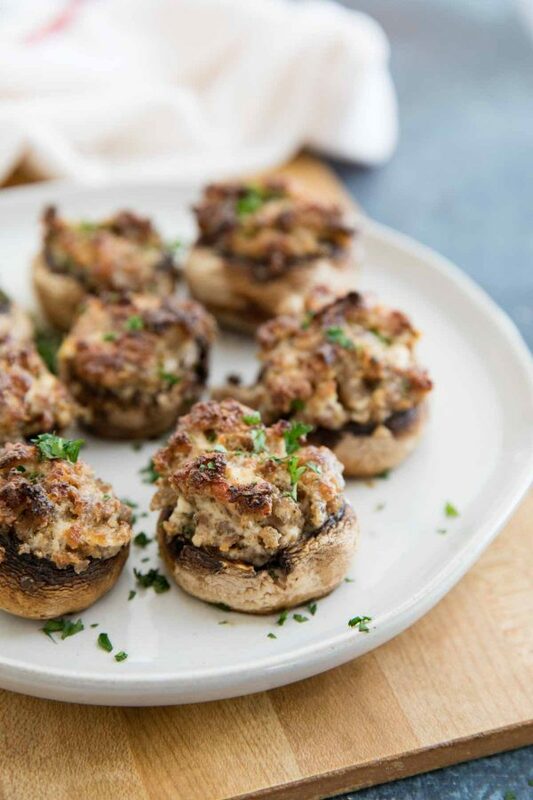 I’m making my list for our annual all-appetizers New Years Eve dinner menu, and these Sausage Stuffed Mushrooms usually make that list! 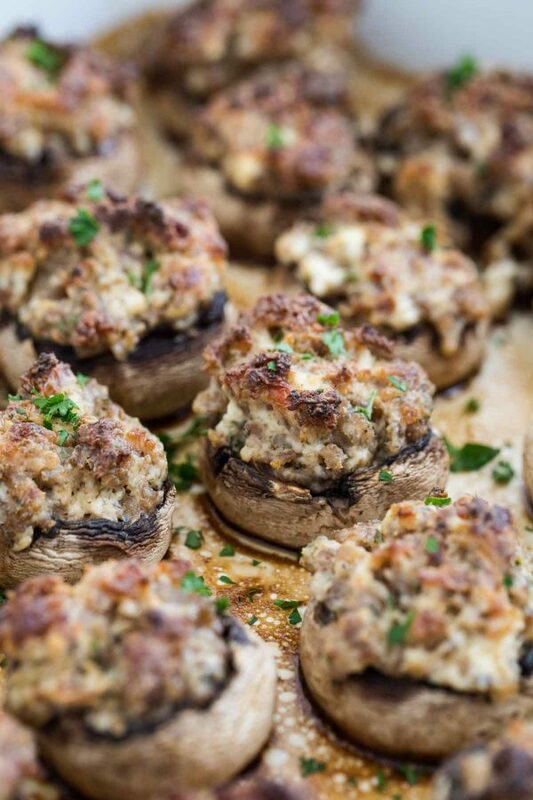 And these sausage stuffed mushrooms – ladies and gentlemen – are a recipe that you want in your holiday arsenal. 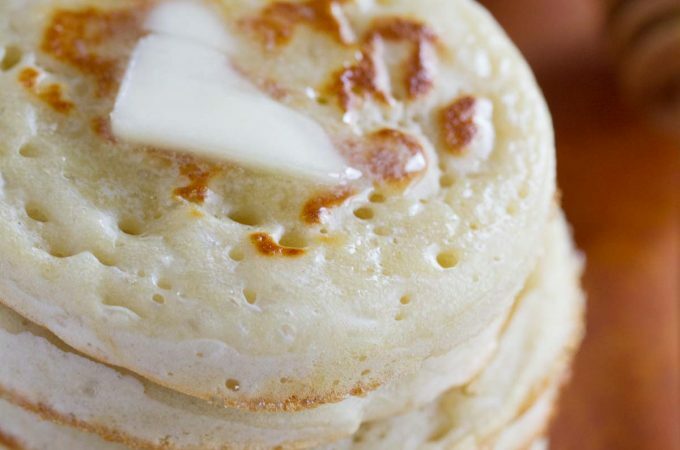 Believe me – you will make these and watch them disappear. And you will be the most popular person at the party. I’m not even kidding you. You might wonder why these are so good – the ingredients are quite basic, and probably not very different than a lot of stuffed mushroom recipes out there. But I’m going to give you the big secret – and please don’t get grossed out because it totally makes a difference. You don’t drain the fat from the sausage. I have made this Sausage Stuffed Mushrooms recipe dozens of times now, and I don’t think I’ve ever been left with any at the end of the night! In a medium skillet, cook the sausage until it is browned and cooked through, breaking it up as it cooks. Do not drain. In a bowl, combine the cream cheese, Parmesan, parsley and sage. Add the cooked sausage (including the grease) and mix until combined. Place the mushrooms, top side down, in a large baking dish. (You may need 2 baking dishes, depending on the size of the mushrooms.) Fill the center of each mushroom with a large scoop of the sausage mixture. Bake in the preheated oven for 40-45 minutes, until the mushrooms are softened and the filling is browned. Let the mushrooms sit in the pan for 5-10 minutes to soak up any juices before serving. 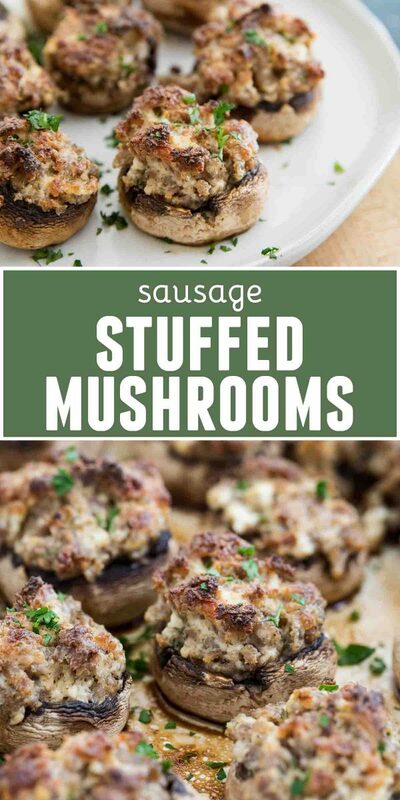 *I have always used a tube of breakfast sausage for these mushrooms. Italian sausage should work, as well, if that is what you prefer. 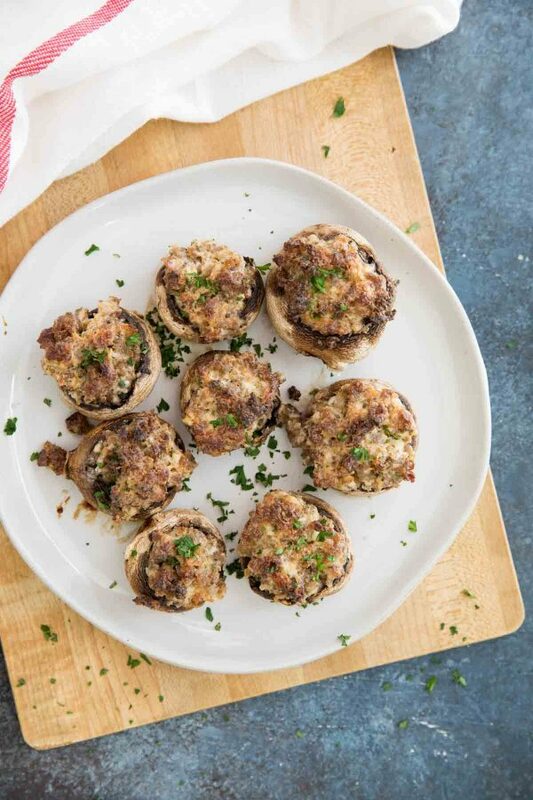 **I like to buy my mushrooms at Costco for these Stuffed Mushrooms because they are so big and are perfect for this appetizer. I LOVE mushrooms. A few people have told me I’m weird b/c of how much I love mushrooms. 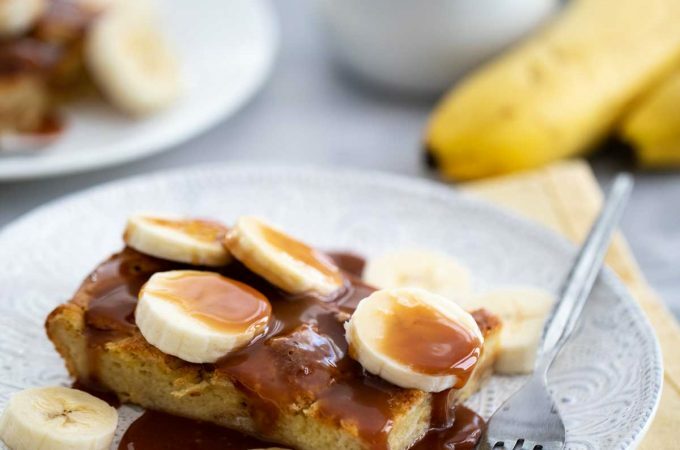 🙂 Always love to see new, yummy recipes with them like this! 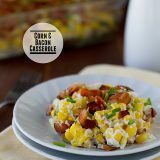 Such a great appeitzer for the holidays! @Colleen @ What’s Baking in the Barbershop? !, I am a mushroom lover as well. I could eat them every day!! I love stuffed mushrooms. and that cheese…oh my! @shelly (cookies and cups), that cheese is seriously life changing!! Favorite. Food. In. Life. Ever. I am a ‘late bloomer’ when it comes to mushrooms, only starting to like them a couple of years ago. Maybe it was cuz I was never served them with cheese, sausage and sausage grease! 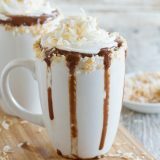 ; ) Must make these soon! @Heather of Kitchen Concoctions, I’m so glad you changed your ways, because you’d totally be missing out without these mushrooms in your life! We make stuffed mushrooms every year for Thanksgiving. 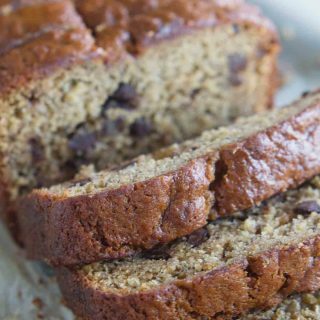 We’ll give this recipe a go! Sausage and Mushroom, I’m sipping Pinot Noir with that! @Matt mmWine Horbund, these would make the perfect addition to any Thanksgiving meal! @Emily, believe me – if I had any left over, I would have eaten them for breakfast!! This reminds me somewhat of an old stuffed mushroom recipe I used to make for parties. I need to find that one and do it again – it was so good! And you’re so right about the fat from the sausage. It surely does keep the finished mushrooms nice and moist. I LOVE mushrooms! And you know that anything “stuffed” is a plus in my book! I can’t wait to make this at my next dinner party – the guests will be so impressed! 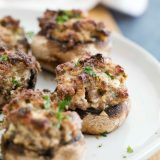 I love stuffed mushrooms, these look incredible! I love that you just used a few flavor packed ingredients to make these yummy mushrooms! I *have* to make these soon! They look incredible! ohhhhh!! My mom’s all time favorite app! 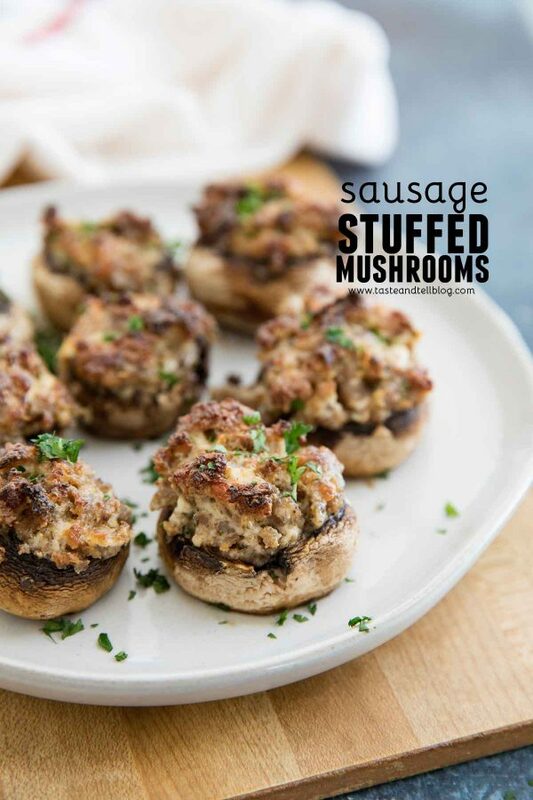 My parents always made stuffed mushrooms with sausage for holiday appetizers…the best! 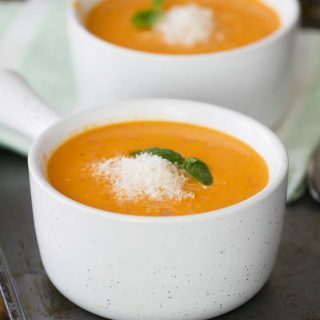 This recipe looks and sounds amazing! I love anything with mushrooms, and couldn’t live without cheese either. One of my favorite cheeses is Pecorino Romano. It is a staple in my house. I must confess, though, I have never heard of this cheese, but will be on the lookout for it now. Thanks for sharing! Your picture of that cheese…I love it. I also love appies season! I love all things mushroom, and couldn’t live without cheese, either. One of my favorites is Pecorino Romano, which is a staple in my house. I have to confess though, I have never heard of this one. I’ll be looking for it. In the meantime, this is a recipe after my own heart, so I will be making it soon. I’m not afraid of a little sausage fat! These look amazing and that cheese didn’t last long in my house. I ate it with sliced apples and peanut butter for days in a row until it was gone. So darn good. Oh my gosh. 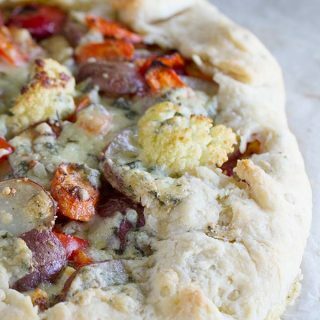 I’m totally making this for dinner tonight. 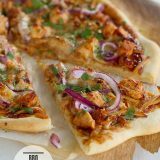 These are definitely going on my holiday menu! YUM! Thanks for sharing these wonderful little appetizers. Gorgeous! And appetizers are definitely my favorite thing to make for Thanksgiving. I mean the turkey is cool too, but it’s the appetizers where you really get to have fun. I’m definitely adding sausage to my stuffed mushroom recipe and I will make sure to add the sausage fat too. Wow!!!! 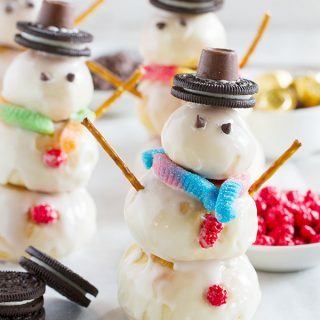 We usually make these when we have friends over and always on Christmas Eve. I can’t wait now! I made these for Thanksgiving, and they were a hit! I’m making them again for a holiday dinner party tomorrow, but I’d love to be able to do everything the day before, refrigerate the uncooked pre-stuffed mushrooms, and then pop them in the oven right before dinner. Would it turn out the same if I did it this way? @Elaine, sorry I didn’t get to your comment sooner! I haven’t tried making them ahead of time, so I’m not sure how they would work. Please let me know if you did try so I will know for future reference!